As some of you probably know, any blade that's sold in Japan must have a JTTAA label on it. 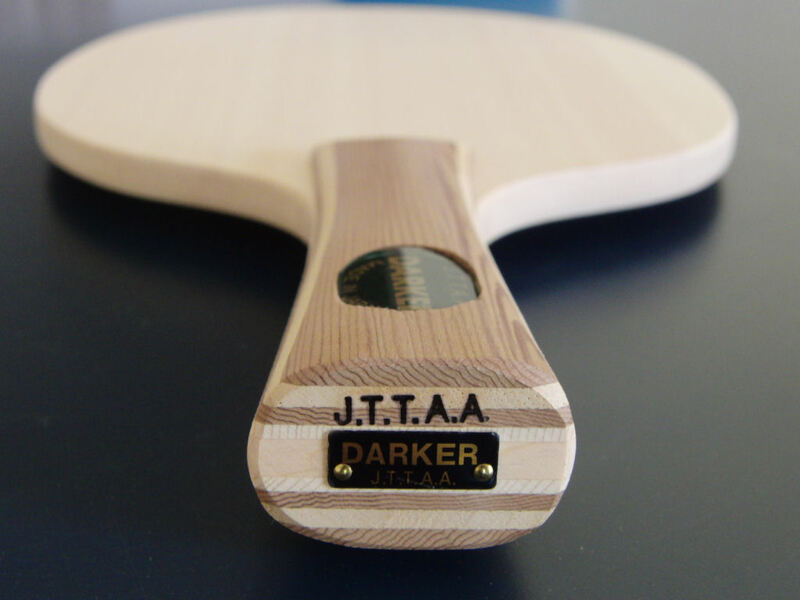 JTTAA stands for "Japanese Table Tennis Association Approved", which means the blades must meet a certain quality requirement to be approved. There is a cost for approval, and this money goes towards TT in Japan, so you can expect to pay a little more for a blade with this stamp. Japanese people in general tend have an eye for details and quality, it's in their whole culture, so I guess it's not surprising that they demand a high standard. TSP for example has blades with and without the JTTAA stamp. I've always wondered why the European ones are less expensive, and I think this is why. Many Sweden-made blades also come with and without the stamp. What's not clear is how this process actually works. Are blades actually made to a higher standard for Japan, or are the higher quality blades from a production run selected for the Japanese market, or is it more or less a 'rubber stamping' process, and the blades are the same? Have you ever compared blades with and without a stamp, and did you notice any difference? Japanese stuff's always been expensive in Japan - take cameras, for instance - you could get Japanese SLR bodies cheaper in the US than you could in Japan in the old days (I checked when I passed through Narita once or twice in the 1980s). would really like to hear from someone who works in the office of JTTAA, or know someone who is and can ask about them. i don't think it's just a badge to tag on. i believe the japanese do have stricter qc on their products either made in japan or made in other country (in this case made in china) that carries the JTTAA stamp. as far as, "What's not clear is how this process actually works. Are blades actually made to a higher standard for Japan, or are the higher quality blades from a production run selected for the Japanese market, or is it more or less a 'rubber stamping' process, and the blades are the same?" i think, even if the material are the same, perhaps their tolerance level for error requirement is smaller. thus, even on premade or cheap stuff could be found with the JTTAA stamps. i heard about some chinese rubbers which sponge varies between batches, perhaps using medium hard sponge and label them as soft when they're running out of the soft sponge, for example. i will try to ask that when i met the above mention company when i go to china this april-may, hopefully i can get a better answer. chinese made blades are getting better and better in their finishing and dare say, quality, perhaps due to the experience of having big brands buying and imposing their qc on the factories. clarifying on the last sentence, about quality. some chinese brands blades prices are getting close to big brands middle high and high class prices. they must have the confidence in doing so, namely by using quality products and or higher qc requirements, even more possible (almost direct copying the formula of the big brands who buy from them, altering them just enough not to breach their contracts/agreements). i personally have not the confidence of shelling out the $$ to give them a try for fear of disappointment. i do however, have tried their low and middle class blades, and in the course of less than 10 years, they have made visible and substantial improvements. now, their cheap prices = good finish, adequate to good feel, more stable performance, giving a more bang for the buck, although still far from the feel and quality of the "real deal" more expensive blades. the middle class are better, given the right marketing, better qc, they would do well in taking some market share from the big brands. chinese factories can churn out same quality or higher even, if required, Apple products is an example. with the many big brands having their blades made in china, chinese brands actually can produce "same quality" blades and sell them for less the big brands prices. what they lack in demanding similar high prices are brand and quality recognition, also the restriction due to business practice traditions. for now, that is, though some chinese brands are getting better in these areas and starting to close the gaps. Last edited by rokphish2 on 03 Apr 2016, 01:32, edited 1 time in total. I can imagine there is some sort of approval process, it might even denote some level of quality, and involve a fee, but I can't see JTTA forbidding the sale of non-approved products in Japan. I mean, what legal basis would they have to do so? And who's going to enforce it? They're completely within their rights to enforce a ban on the use of non-approved stuff in sanctioned TOURNAMENTS (this has it's own associated can of worms, which I won't get into), but they can't prevent people from importing and selling non-approved stuff. As I said, I'm pretty sure I've seen this stamp on the old pre-made Japanese penhold blades Butterfly sold. Chinese blades - at least some of them - are as well made as anything else out there. Stamp or no stamp, I can imagine that lower quality blades (and other equipment) won't sell well in Japan simply because the quality is low, unless the price is correspondingly low. And I can well imagine that a Chinese OEM that sent a batch of blades over that didn't meet the QC standards of its client would get the batch rejected, stamp or no stamp - these things are regulated by contract, usually. Last edited by iskandar taib on 03 Apr 2016, 01:36, edited 1 time in total. while they can't impose it on personal level, they can impose it on businesses who's importing non JTTAA aprroved stuff. although some businesses would have some way of going around that imposition, but that's more like the exception to the rule. How?? They'd need leverage, what sort of leverage would they have? If it's some company importing table tennis equipment, they might organize a boycott or a ban of the use of their products (I can see them getting sued for doing this, though - restraint of trade), but if some small company brought in several hundred bats and was selling them to sports equipment stores and supermarkets, what can they do? I mean, is there actual LEGISLATION saying it's illegal to import non approved equipment?? There would have to be if there's a ban. (If there is, someone would have had to write a bill, there would have had to have been a vote in the Parliament, etc.) I'd be very skeptical that anything like that exists, Japan is a member of the World Trade Organization, you CAN'T just pass legislation like this, it's called protectionism! i think it's more common in businesses. each country has their own regulations and what not. even more so when importing stuff from another country and in big volumes. the companies doing importing would have to declare the items their importing, and the officials then would have to check whether those items are within the regulations or not. these in parts of their way of cutting down on illegal/counterfeit products, products with low standards that are harmful, even those who are trying to avoid paying taxes, etc. for food they have their own standards and the stamp of approval, for wood items, for medicines, etc. that's the theory on paper. in many countries, the importing companies and certain shipping companies and also officials are doing some underhand deals so the flow of shady stuff are keep flowing in and out. the JTTAA is some sort of that regulation for Japan. we have similar things called SNI here. USA have similar things like FDA, with items having FDA approved stamp. When I go to USA I can bring some non FDA approved medicines with me, but in small amounts for personal use, and not part of the big no no lists. If I were to carry a lot, they would certainly get confiscated. Now, I can have them shipped to USA one way or another through some back channels, and when received in USA, I can sell those medicines to whoever I want. But in theory, there is imposition on those items. I might not get caught if I were stay being a small fish, but would certainly get caught when my business grows, or bad lucks being found out early. the JTTAA is some sort of that regulation for Japan, for the table tennis blade/equipments. i think to simplify matters, having some sort of stamps would mean that the items would have to go through some sort of standards/requirements, which is somewhat better than not having them at all. having them going through the standards/requirements of certain company/country who have a better reputation would elevate the value of having the stamps. there would be occasions of quality of products is the same or even better compared to the ones having stamps, but in general, having the stamps would be better, if not in actual quality, at least in perception, which is a win-win situation. Food safety is one thing, the government WOULD get involved with that. Same when it comes to pharmaceuticals. Counterfeit goods, yes - the government does get involved with that issue, there's intellectual property and copyright involved. Electrical goods? Sure, but here it's a civil body that's connected with the insurance industry (Underwriters Laboratories - UL) - there's public safety involved. Cars? Sure, there are emission and safety standards. Toys? Certainly - public safety again. You don't want little kids choking on little parts. But table tennis equipment? This would fall under stuff like shoes and socks and shirts and furniture - why WOULD the government get involved??? And if the government's not involved - how exactly is JTTA going to enforce anything, except where it comes to what they control - tournaments and maybe clubs? I really doubt they'd be able to do that, even - if they did it'd invite retaliation. Perhaps not from the Chinese, but I can imagine the Swedish TTA would then require an expensive SwTTA stamp for use of Japanese equipment in THEIR tournaments and clubs, since the Japanese are making THEIR companies pay for the Japanese stamp. I think this JTTAA stamp is simply a mark of quality - to get it, the products have to meet certain standards. Companies pay to get it because they can charge more/sell more with the stamp than without the stamp. I really doubt there's any kind of requirement to have the stamp to sell equipment in Japan, but if you do have the stamp, it's also a visible sign that you are supporting JTTA and that would be brownie points in the minds of some people, who'd be more likely to buy the equipment. That would be great! I'll also see if I can get some more details from the Japanese manufacturer that we deal with. i'm scheduled to meet with them around second week of may. i'll also try to get my hands on the "returned" item. from looking at the blurb, it looks like a very good blade. Thinking about this some more - I seriously doubt you'll find any differences between items that have the stamp and those that do not. When you mass-manufacture something, it doesn't pay to deliberately make part of your production differently than another part of your production. It's cheaper to make everything the exact same quality than to make half of it higher quality and another half lower quality. You DO have variations between mass-produced items, that's why there are rejects, and lower-grade balls, for instance. But blades? Any flaws in blades would, I think, result in a blade being rejected altogether rather than sold without a JTTAA stamp. Sure, you'll have blades that are heavy, and blades that are light, but you won't find, for instance, badly glued veneers or bad sanding or lopsided handles. Why would the stamped blades cost more? And why would companies NOT stamp some of their blades? If JTTA does charge a hefty per-item fee for the stamp, then it gets passed along to the customer, that's why. A manufacturer would simply not stamp blades that aren't destined for Japan to avoid paying the fee and therefore would be able to sell the blade for less - remember they're competing in a marketplace, so a lower price is a competitive advantage. it's different, the rejects are not some or a few defects... it's for the whole batch from what i read. regardless, i would know more when i met and ask in person. another thing, even for regular mass-product stuff, there's will be defects anyway, part of the process. there will be some % accepted for defects. some notoriously higher than others. for example, a while back palio cj8000 was quite a hit for cheap rubbers. but in the next batch or so, the top sheets were easily separated from the sponge, many even already separated while still in packing. "Same thing has happened to my son's Infinity. He's only 9 and although he's good for his age he hardly hits like Ovtcharov so it has to be a manufacturing fault. Half the top layer is flapping about. I contacted Stiga but they just told me to go back to where I'd bought it from even though under EU law they are responsible. I've done what they asked though so we'll see what happens next. They say the test of a company is not whether you ever have a problem but by how they respond when you do have a problem. Stiga passed the buck so let's see how well Dandoy do! " I used to work selling motorcycle parts and we imported some from china. I went with the boss around china to the factories and ordering parts from the factory. For same item, there will be different classes of quality with different prices. A = $$$, B = $$, C = $... This is for the same item with the same factory, not comparing with different company. We even had some orders from the factory who's making the parts for HONDA, the original parts for them. But we only pay small fractions of the item because we buy one with much less quality, for the same item. So, for the factory, it actually pays for them to have different quality of the same item, that way they can sell more to different parties who's looking for particular range of price. I thought peeling plies (when you removed a rubber sheet) wasn't a mark of poor/bad quality, it was the result of the too-strong water-based glues we use these days, coupled with the lack of lacquering (some people believe it changes the "feel" of the blade). From what I've heard, it's the more expensive blades that tend to peel, this is why people are told to lacquer their blade faces, and to peel rubber very, very carefully. This was never an issue in the old days with VOC glues. Palio rubber quality control? I know it's bad and inconsistent from first hand experience.. But they can't just sell the first batch with a "quality" stamp and the second one without - no one would buy the second batch. The only remedy would be to destroy the second batch, unless they want to taint ALL their production with the stigma. if you looked carefully at the photo, it's not splintering problem on the top ply, rather the whole ply got separated. in the photo it can be seen the second ply got separated from the inner ply.